Click Here To See Tales of Suspense #67 Comic Book! 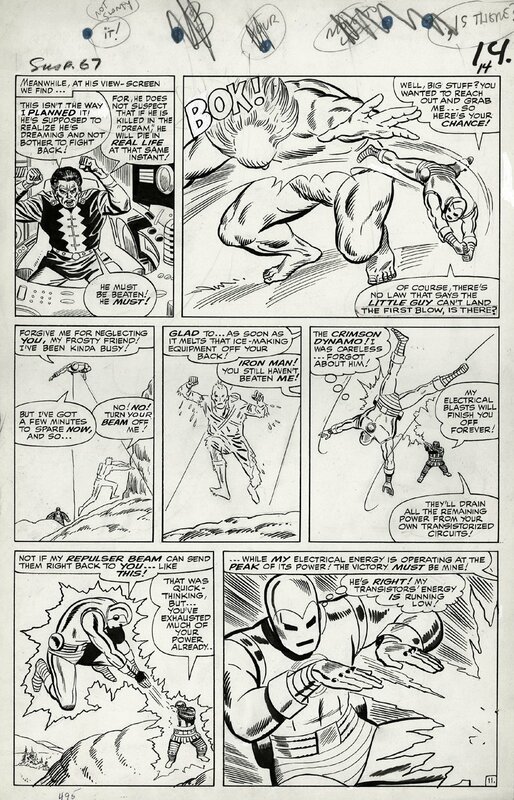 Check out this prime era Marvel Silver Age Iron Man page from 1965, drawn by his co-creator, Don Heck. This great battle page appeared in Tales of Suspense #67. We see Iron Man battling several of his foes including Crimson Dynamo, Jack Frost, and Gargantus, who are all being controlled by the Dream-Master, the villain we see in the first panel, who is actually Count Nefaria in disguise. 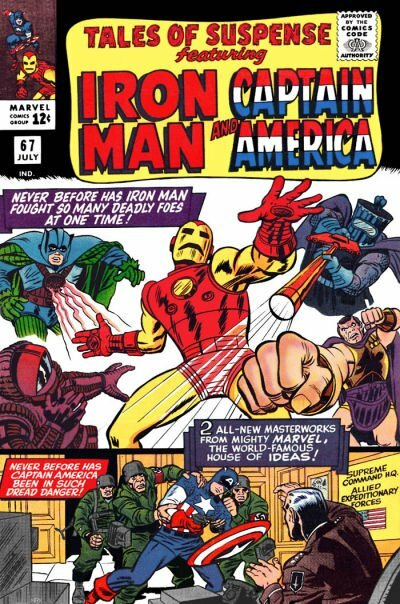 Iron Man has been a Marvel mainstay since his first appearance in Tales of Suspense #39 (1963). Thanks to the enormously successful Iron Man and Avengers movies where Iron Man has been perfectly portrayed by Robert Downey Jr., the character has moved into the upper echelon of superheroes right up there with Spider-Man, Batman and Superman. With his key roles in Captain America: Civil War and Spider-Man: Homecoming further extending his legend, and well as Avengers: Infinity War. The Crimson Dynamo first appeared in Tales of Suspense #46 (1963). Jack Frost, who later became Blizzard, first appeared in Tales of Suspense #45 (1963). Gargantus was the monster who fought Iron Man in his second story ever in Tales of Suspense #40 (1963). Count Nefaria first appeared in Avengers #13 (1965). Don Heck is one of the key architects of the early Marvel Universe along with Stan Lee, Jack Kirby, as Heck co-created Iron Man, Black Widow and Hawkeye. ALL art on our website (including this one) are able to be purchased with VERY fair time payments, and trades are always considered towards "ANY" art on our website! Just send us an email to mikeburkey@aol.com and we can try to work something out.